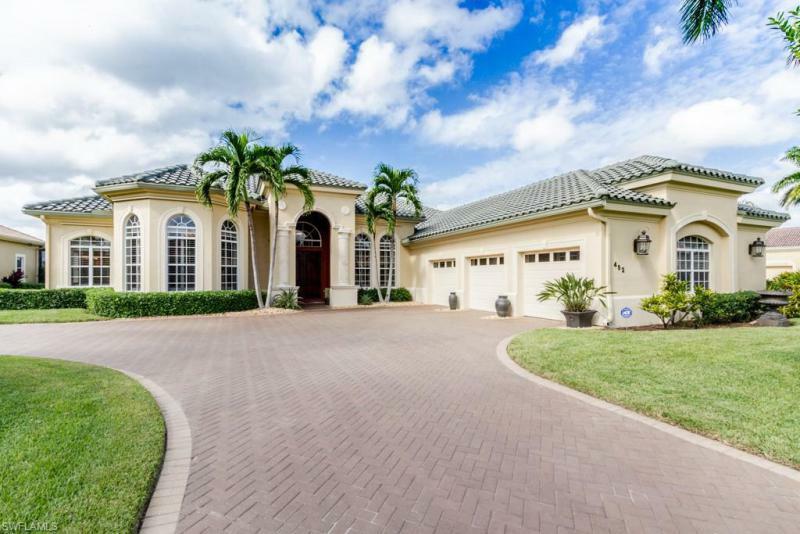 This terracina home promotes tropical and golf course living. Expansive views overlooking the 2nd hole, this elegant residence features marble columns ahead of double entry mahogany doors leading to marble floors, volume ceilings and light, bright rooms throughout the home. A split floor plan offers privacy and functionality. The master suite has hardwood floors, dual master bathrooms, a cozy gas fireplace, french doors to the lanai and crown molding the study has tiger wood flooring and a custom built-in desk. The living room entices gatherings with a gas fireplace and is adjacent to the generous-size dining room. Your open kitchen built for a chef offers a gas cook-top, granite counters, a bar area with wine fridge, and eat-in dining area. 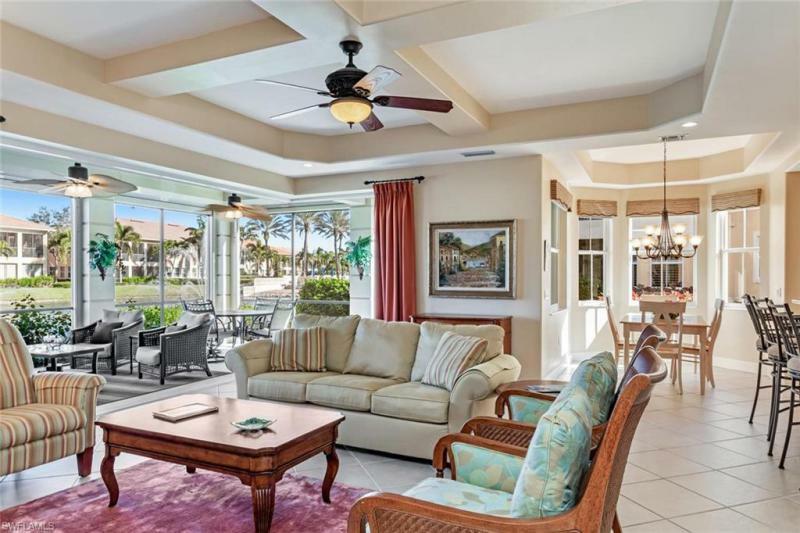 The family room is ready for entertaining and connects the indoors to the outdoors with the disappearing sliding glass doors which open to seamlessly add the expansive lanai to your living area. Relax by your heated pool and spa and enjoy the rolling hills of the golf course and the one-of-a-kind sunsets with the sw exposure. A truly elegant home providing privacy, beauty and sophistication in the terrific location of the vineyards. Waterfront-just reduced $50,000 & offered turnkey furnished!! Priced to sell now. Great rental income. A fantastic, pristine north facing residence that highlights the spectacular water view that your family will enjoy each day. This elegant first floor, corner coach home provides almost 3,000 sf of spacious living in a very private setting. The unit is turnkey furnished, boasts 9. 5 ceilings and three oversized bedrooms with en-suite baths and walk-in closets plus an open den. The generous, well equipped kitchen is designed for your next party. Electric shutters on the lanai keep the porch and furnishings clean and ready to relax. An attached two car garage opens directly into the unit for ease of access. Located in avellino isles, a private gated enclave within the golf course community of the vineyards. Specific amenities include a beautiful clubhouse with fitness center, community room, card room, kitchen, service bar and grilling area. All top notch! The infinity edged pool is highlighted by the lakefront fountains. Membership at the vineyards country club is optional offering golf, tennis, pickle ball, wellness center, spa, bocce, dining and many other family events. Gorgeous golf course views from this end unit, updated, light and bright condo. All new laminate hardwood floors throughout, with tile in baths, this 2+den or 3 bedroom is a spacious 1626 sf under air, with a front and back screened lanai for double the outdoor living space, with a total of over 2000 sf! The front lanai is a lovely welcoming patio and the back lanai is your own endless golf course view in paradise! Storm protection with pull down shutters; elegant plantation shutters throughout main living areas, new wood laminate floors throughout, beautifully furnished in clean, modern tones with new sofa and seating. Centrally located to shopping dining, arts and entertainment, easy i-75 access to airport. Optional membership to vineyards country club offers 2 championship golf courses, 12 tennis courts, wellness center, dining, bars, amenity-rich social calendar. Make an offer today! Dare to compare in hammock isles- over $250,000 in improvements. Having ample room for entertaining; this remodeled one level four-bedroom plus den home awaits the most discerning buyer. From the moment you enter through the hand forged wrought iron custom door; you will experience and see beautiful and modern dcor. Stainless steel appliances, marble floors, stunning light fixtures, large closets, plenty of storage, brand new roof and so much more. It truly is a fabulous place to live! Vineyards is a private country club that has two award winning 18 hole championship courses for all skills levels. There is a brand new 15,000 sq. Ft wellness center and spa that will focus on your well being. From tennis to pickle ball to hundreds of activities annually, memberships are available. Relax in peaceful tranquility by water features, a lake, white flowing curtains and a redesigned private pool and spa. Enjoy the company of family and friends by your custom bar/grill and travertine paved and screened in lanai live the vineyards lifestyle in style! The brand new and beautiful roof has been installed - come see! The best just got better!! New roof was installed and association qrtly. Fee was just reduced to $1,765. , which includes fiber optic high definition tv, high speed internet & phone line all included in association fee and more, please see attached list for complete list of inclusions. Natural beauty surrounds you with preserve views from the lanai of this delightfully bright & spacious 2br/den/2ba 1st floor coach home w/ attached garage. Offered turnkey furnished! End unit provides plenty of light with windowed dining room & bay window in den/family room. Home has been immaculately maintained, a/c and water heater are 5 years new, kitchen appliances, plumbing & lighting fixtures are also newer, custom built-ins in master walk in closet, wood plantation shutters throughout & freshly painted interior. Home comes with a one-year home service warranty for added peace of mind. Silver oaks offers an inviting heated saltwater pool & spa with a community clubhouse ideal for hosting special events. 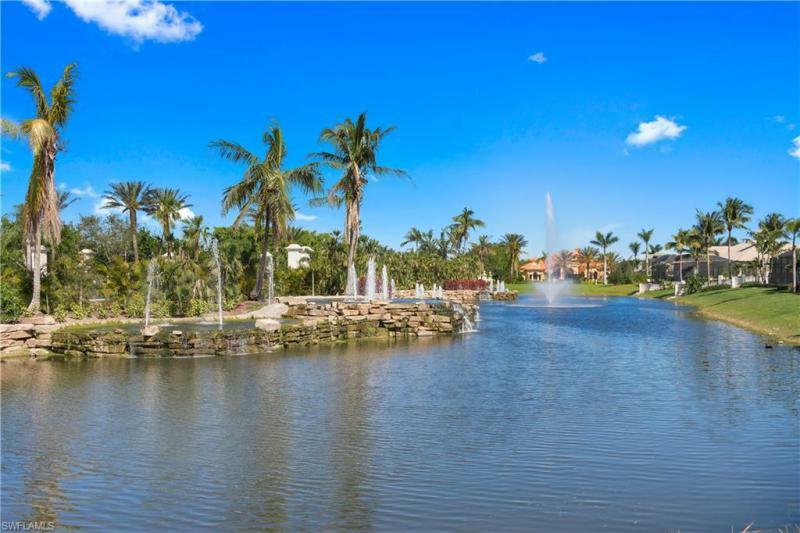 Silver oaks is centrally located just minutes to everything naples has to offer and one of the best values in vineyards. Welcome to your home in paradise! This immaculate 3 bedroom plus den 3 bath home is situated on a large, private lot, surrounded my lush, tropical landscaping and an oversized pool, spa and lanai. An open, spacious floor plan, tall ceilings, new paint and a chef's kitchen are just a few of the fine features of this home. Each bedroom is en suite, offering great space for friends and family. Other features include new glass tile kitchen backsplash, master bathroom upgrades, and stunning light fixtures throughout. New lanai screening march 2016, new pool pump june 2016, new pool heater 2015, and new landscaping june 2017. Home warranty included. The vineyards is a gated golf course community located in north naples and offers optional golf and or social memberships. With 36 holes of championship golf, 12 har-tru tennis courts, award winning fitness center, resort style pool & spa are just a few of the amenities. Fiber optic integration to support high definition tv, next generation internet and carrier class telephone are included in the quarterly fees! This is the home you've been waiting for to enjoy the florida lifestyle you deserve! Major price reduction! Value! Best unit in silver oaks! Own your own beautiful first floor coach home end unit 2 bed 2 bath plus small den off kitchen area. 1 car attached garage in the gated community of vineyards at silver oaks! Split floorpan! Electric hurricane shutters! Fall in love from the moment you step in the door! White plantation shutters, tile throughout the main living areas & carpet in the bedrooms. Updated kitchen with gorgeous granite counter tops & back splash! End unit with natural light! Master bedroom with walk in closets. Master bath with dual sinks & updated shower! Large laundry room with sink. Screened lanai off living-room with lush landscaping providing privacy. Steps away from the community pool & spa & small clubhouse. New tile roof. Hoa fees quarterly cover cable, internet/wifi access, irrigations water, land/lawn maintenance, water & community amenities! Minutes to dining, popular shopping & entertainment desitiniations mercato & waterside & the white sandy beach! Social & golf memberships available but not mandatory! Location location! Motivated seller! Great winter get away! H. 13481 price reduction!! For limited time only. Inside this wellington model at arbor glen in the vineyards, with it's sprawling courtyard floor plan complete with separate guest quarters. Almost 3,200 sq ft, this home is beautifully cared for, open and light. It's a fabulous home for entertaining, with dining and living areas opening to a second lanai with golf course view, a wet bar, and an easy transition into the kitchen complete with butler's pantry, 42 solid wood cabinetry, new stainless appliances and corian counters. There is a breakfast bar, breakfast room and family room. There are 10-13' ceilings throughout, crown molding, and high end finishes. The master suite is truly that, with tray ceilings, his and hers walk-in closets, an enormous bathroom with double sinks, jetted spa tub and large walk-in shower. The courtyard is enormous with an over sized pool great for daily laps. Enjoy a luxurious lifestyle, a home great for entertaining, yet feel cozy in this comfortable home. The vineyards, known for it's beautiful landscaping offers a great lifestyle with world-class amenities. Great naples beaches, shopping, restaurants and healthcare are all close by. 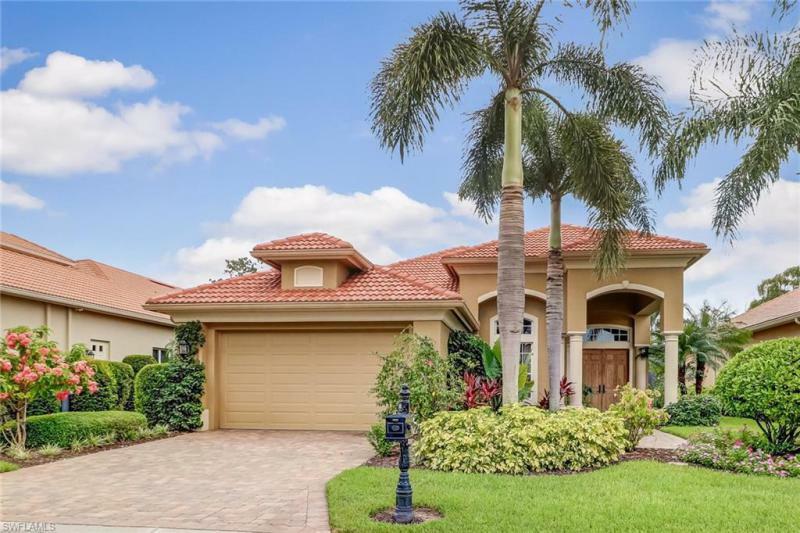 As of today, 4/21/2019 the average home price for homes for sale in Naples-The Vineyards is $581,571.